Guided ultrasonic waves (15) are used for the detection of defective tubes (10) in a heat exchanger or steam generator by using a transducer (11) which generates a guided wave (15) at predetermined parameters of phase velocity and frequency to operate at a point on a dispersion curve which minimizes leakage (16) of ultrasonic energy to fluid (13) surrounding the tube (10). Various techniques of generation ultrasonic waves of various phase velocities such as a comb type filter allow phase velocity points on a dispersion curve to be freely selected. The present invention is directed to a method using a bore probe for tube inspection with guided waves and more specifically where the guided waves are ultrasonic and are used for sensing defects in heat exchanger and steam generator tubing. The use of guided ultrasonic waves for the nondestructive evaluation of tubing is well known. Other than inspect on a point-by-point basis, procedures which are commonly used in normal beam ultrasonics utilize the signal response (echo) of such waves. For example, in an article entitled "A Novel Guided Ultrasonic Guided Wave Technique for Improved Tubing Inspection Efficiency", Proceedings of the 11th International Conference on NDE in the Nuclear and Pressure Vessel Industries, Albuquerque, New Mexico, 30 April-2 May, 1992, pp. 49-54, the use of guided waves to inspect an entire length of tubing of several meters is discussed, including a generation technique using as an ultrasonic radiator a conically shaped piezoelectric element housed in a plexiglass enclosure which is used as a probe which is inserted in the end of a tube. Unfortunately the science behind guided wave technology is very complex which has hindered the commercial use of such probes in ultrasonic nondestructive evaluation. And such technique is needed because of America's aging power generation infrastructure where it is now necessary to be able to efficiently inspect all types of tubing and types of materials. Of particular concern today is the thousands of miles of heat exchanger and steam generator tubing. It is a general object of the present invention to provide an improved method of using a bore probe for tube inspection with guided waves, and also apparatus therefor. and selecting points of substantially zero or minimal attenuation on the curves and determining the the frequency and phase velocity of such selected points and utilizing such determined frequency and phase velocity as the predetermined parameters for generating a guided wave. In addition there is provided both apparatus and method of generating guided waves by providing a transducer with spaced ultrasonic radiators, the spacing being proportional to the specific phase velocity which is required for a desired point on a dispersion curve. Figure 1 is a cross-sectional view of a bore probe inserted in a typical tube employing the apparatus of the invention. Figure 2 is a detailed cross-sectional view of a portion of Figure 1 showing the operation of the invention. Figure 3 is a circuit schematic of and associated wave forms of a device used in the present invention. Figure 4 is a perspective view of ultrasonic waves in a tube illustrating the operation of the invention. Figures 5A and 5B show the echo reflections of ultrasonic waves in a tube. Figure 6 are characteristic dispersion curves illustrating the present invention of phase velocity versus frequency x thickness. Figure 7 is another form of the characteristic dispersion curves of Figure 6 showing having attenuation rather than phase velocity as in axis. Figures 8A, 8B and 8C are curves showing the wave structure of both radial displacement and longitudinal displacement across the thickness of a tube at three points of interest on the dispersion curve of Figures 6 and 7. Figure 9 is a flow chart illustrating the process of the present invention. Figure 10 is a set of dispersion curves illustrating the operation of one embodiment of the invention. Figures 11A through 11D illustrate possible wave structure patterns across the thickness of the tubing. Figure 12 illustrates a set of curves similar to the dispersion curves of Figure 10 but illustrates another embodiment of the invention. Figures 13A, 13B and 13C are cross-sectional diagrammatic views illustrating another embodiment of an ultrasonic radiator in accordance with the present invention. Figure 14 is another embodiment of an ultrasonic radiator. Figure 15 shows a technique for computing phase velocity for the ultrasonic radiators of Figures 13A through 13C. Figure 16 illustrates the technique of computing phase velocity for the ultrasonic radiator of Figure 14. Figure 17 is a cross-sectional view of a type of ultrasonic receiver of the present invention. Figure 18 is a cross-sectional view of another ultrasonic radiator of the present invention. Detailed Description of Preferred Embodiments Figure 1 is a schematic cross-sectional view steam generator tubing 10 having a bore probe 11 inserted in the tube which is capable of generating guided ultrasonic waves down the tube in the direction indicated by the arrow 12. As will be discussed below, such guided waves travel several meters in order to provide a reflective wave which indicates defects as well as other anomalous conditions in the tube. Other information which may be gained may also be defect or flaw classification and sizing analysis. This is all achieved by the use of a fixed probe 11 in the end of tube 10 which after insertion need not be moved during inspection and/or rotated. Normally as indicated at 13, tube 10 is a steam generator or heat exchanger tube which would be immersed in water. And then as will be discussed below, as more specifically shown in Figure 4, such water will cause the guided waves 15 which occur in the thickness, "d" of the tube wall 27 to leak most of their energy, as shown by the arrows 16, into the surrounding water. This, of course, causes severe attenuation and limits the penetration distance of a guided ultrasonic wave for purposes of defect detection. Still referring to Figure 4, the distance down the tube is the Z distance, the thickness of the tube wall is designated, d; the inner radius is "a", the outer radius is "b", and the radius and angle Θ relationships are indicated. Referring back to Figure 1, the ultrasonic bore probe radiator device 11 includes a first conical piezoelectric element 21 and a oppositely mounted conical piezoelectric element 22; one is used for transmitting an ultrasonic guided wave down the tube and the other for receiving. 21 within the tube 10 where the sloped or conical side of the transducer 21 forms an incident angle 26 with the tube wall 27 whose SINE function according to Snell's law, is directly proportional to the phase velocity C ^, of the ultrasonic guided wave down the tube. Snell's law stated in words is that the incident angle 26 is equal to the arc sine of the ratio of the phase velocity of the longitudinal wave in the plexiglass housing 28 'see Figure 1) in which element 21 is encased and the phase velocity of the guided wave down the tube. Thus it is apparent that by adjustment of the incident angle 26, phase velocity may be adjusted. As illustrated, radiator 21 generated the desired radially symmetric waves. However, a preferred form of radiator is a truncated conical piezo-composite shell which has ceramic elements embedded in epoxy. This is commercially available from Kraukramer Branson Company of Lewistown, PA, Product Code 389-001-900, Model BPDU, 3.5 MHz, Dual Conical Elements. The excitation to the piezoelectric radiator 21 is indicated at 28 and is provided as shown in Figure 3 by a tone burst generator 29. Such generator generates a center frequency, fc, with a typical range of frequencies of 5 to 10 megahertz. Then by varying the small number of cycles, e.g., 10 to 20, in the tone burst 31, the desired effective bandwidth excitation signal may be optimized. In operation, the conical piezoelectric transducers 21 and 22 provide generation or reception of an angled beam which provides almost all the possible modes of ultrasonic generation which could exist in the tube and, in addition, typically the wave generated is in a radially symmetric longitudinal mode. Since the incidence of the ultrasonic wave is symmetric; it is independent of the angle θ (see Figure 4). The above article entitled "A Novel Guided Wave Technique for Improved Tubing Inspection Efficiency" discloses such possibilities. Again referring to Figure 1, the remaining structure of the ultrasonic radiator includes at its forward end a centering guide 33 with semiflexible fingers attached to a buffer unit 34 which in turn is attached to a first water seal unit 36. There is a second water seal unit 37 which in conjunction with a third water seal unit 43 retains the plexiglass housing 28 for the two ultrasonic radiator elements 21 and 22. Connecting seal elements 36 and 37 are water outlet ports 38. Plexiglass housing 28 is separated from the tube wall 27 by a thin film 40 of water. Then at ultrasonic radiators 21 and 22 is copper tubing and cables and water drain 41. An acoustic barrier 39 isolates the two ultrasonic radiators. Finally wand 45 provides a coupling tube to electronic frequency generating and analyzing devices and in general for analysis of the wave structure of the reflected echo, which as well as location provides other information as to sizing and type of the defect. Figure 5A shows the echo waveforms, for a tube which is not immersed in water, and Figure 5B for a tube which is water loaded. The horizontal axis is the time of the reflection in microseconds and the vertical the resultant amplitude of the echo which is detected by, for example, the element 22 of Figure 1. The generated wave occurs at zero time and then as shown in Figure 5A there are four reflections designated 1, 2 , 3 and 4. As Figure 5B illustrates, because of water loading, the waves 2 and 4 disappear because of the "leakage" caused by the water loading. This concerns a concept of the present invention which will be discussed below. Figures 6 and 7 illustrate dispersion curves which have been theoretically generated for a steel tube 10 such as shown in Figure 4 which has the various ratios of thickness dimension d and radius R as illustrated in the drawing. The dispersion curve for each ratio is illustrated. The material of the particular tube is steel, as indicated. These dispersion curves may be generated utilizing the matrix as shown in Equation 1 on the Equations page. And the various terms of the matrix B11 through B55 define and relate to the material properties of the tube including the material which is steel and its dimensions. 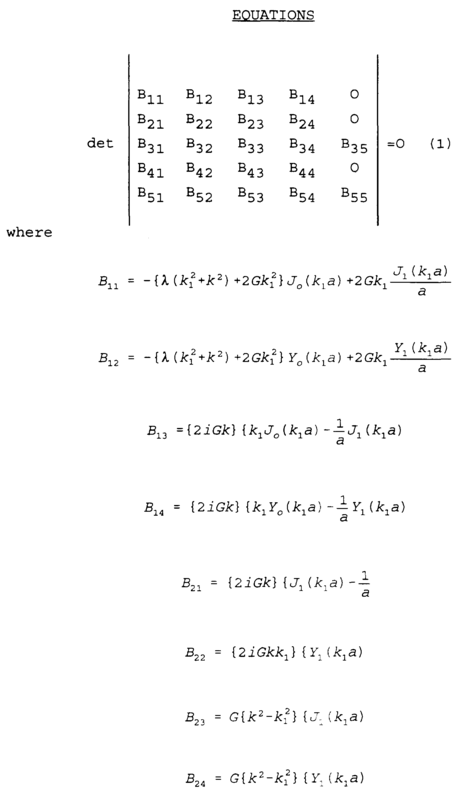 More specific details of how the equations are derived are well known by the following two references, the second reference being co- authored by one of the present inventors, but less than a year before the date of the present patent application. 2) J. L. Rose, Y. H. Cho and J.J. Ditri, "Cylindrical Guided Wave Leakage Due to Liquid Loading", Review of Progress in Quantitative Nondestructive Evaluation, Vol. 13, pp. 259-266, March 1994. Referring to the dispersion curves of Figure 6, the four modes shown are the L(0,1), L(0,2), L(0,3) and L(0,4). By using equations 2 and 3, the dispersion curves of Figure 7 maybe generated, where attenuation is the vertical axis and f*d the horizontal. Referring to Figure 7, from this set of curves there can be determined points of minimum attenuation; these have been designated points b and c. Point a is obviously a point of higher attenuation. Thus points b and c are optimum operating points for generating a guided wave having minimum attenuation or good longitudinal penetration in the tube. Referring to the dispersion curves of Figures 6 and 7, the choice of the mode, frequency of operation and the phase velocity which all result in a selected point on a dispersion curve have significant consequences; for example, at point c for a phase velocity of 6mm per microsecond and an fd product of 3.7 Mhzmm, no leakage of ultrasonic energy occurs if a tube is water loaded on the outside surface. On the other hand, at point a, there is significant and severe water leakage. The foregoing is further illustrated in the displacement curves of Figures 8A, 8B and 8C where the points b, a are respectively illustrated. These curves show the radial and longitudinal displacement distributions across the thickness of the tube at the three points of special interest a, b and c. The vertical axis of these curves is normalized displacement and the horizontal axis is "0" for the inside wall with the outside wall surface at "100" location. For the points b and c (Figures 8A and 8C), the radial or R displacement is close to zero at the outside wall surface "100"; thus, they are conducive to no energy loss into the fluid if the tube were fluid loaded on the outside surface. Longitudinal displacement shown by the other "L" curves is still substantial for crack detection on either the outside or inside surface. The displacement curves are generated by using a standard wave structure analysis from well known formulas in elasticity as, for example, shown in the following references: 1) S. P. Timoshenko and J. N. Goodier, "Theory of Elasticity", 3d Edition, McGraw-Hill, New York, 1973, 2) D. C. Gazis, "Three Dimensional Investigation of the Propagation of Waves in Hollow Hollow Circular Cylinders I; Analytical Foundation", The Journal of the Acoustical Society of American, Vol. 31(5), pp 568-578, May 1959. Such curves are also shown in the publication "Ultrasonic Guided Wave Inspection Concepts for Steam Generator Tubing", Materials Evaluation, Vol. 2, No. 2, February 1994, pp. 307-311. In summary, because of the radial displacement in a particular mode which is close to zero at the outside surface of its waveguide (tube 10) , there is consequently no energy interaction and interface between the waveguide and outside wall. This means that the radial power flow of point c is independent of water loading and thus propagates long distances without being severely attenuated. In comparison, point a (Figure 8B) because of the significant radial displacement at the outside surface (see R curve), point a loses its ultrasonic energy drastically. Thus the method of the present invention may be summarized with reference to Figure 9, where to implement it, the following steps are illustrated. First in step 51, the properties of the tube and thickness must be determined, and then in step 52 dispersion curves of Cph vs. f*d are generated for many modes. And in step 53, the attenuation versus f*d is determined for each mode. As an equivalent to this step the radial displacement curves which contain equivalent information may also be utilized. In step 54, the minimum attenuation points are found. The resulting frequency and phase velocities derived from the curves of Figures 6 and 7 may be utilized to generate an effective ultrasonic guided wave for tube inspection. To choose the proper phase velocity, in one embodiment of the invention, the angle of incidence of the conical radiator may be varied in utilizing Snell's law. Referring to Figure 10, which is another set of dispersion curves where phase velocity is held constant. Then frequency may be shifted and all the points occur on a horizontal line. This illustrates that with a fixed conical angle radiator as illustrated in one embodiment, as shown in Figure 21, that as illustrated in the drawing, there are only four possible excitation points. Referring to Snell's law, by way of that law, and a fixed angle of incidence for a conical radiator of the type shown in Figure 2, only that one particular value of phase velocity becomes possible. Unfortunately, these four points of choice may not be the four points of choice with respect to optimized penetration power for defect detection, classification and sizing. An optimization parameter of principal concern is the wave structure across the thickness of the cylindrical tubing as discussed above. This wave structure will relate to the longitudinal or radial displacement components shown in Figures 11A through 11D. Here a series of four different wave structure possibilities for either the longitudinal or radial displacement component is illustrated. If one wave structure is chosen, a particular phase velocity value must be chosen. The two optimal configurations shown are for Figures 11A and 11B. A displacement value on the outside surface of the tube in 11A is practically zero whereas in 11B it is a maximum value. In Figures 11C and 11D are shown intermediate possibilities for unusual variations. If tubing is located under water, it is desirable to have the radial displacement component on the outside surface of the tube to be almost zero. On the other hand, with respect to the detection of defects on the outside surface of the tube, if these are of critical importance, the longitudinal or radial displacement components should be of maximum value at the outside surfaces as in 11B. Then, again with respect to Figure 11A, if there are fins on the outside of the tube, the pattern of 11A might be most useful since this response would be relatively insensitive to items contained on the outside surface. Thus it is desirable to be able to produce a variety of different specified points on a dispersion curve such as illustrated in Figure 12. Here where both phase velocity and frequency may be freely varied, there is an unlimited selection of points. Because of this unlimited selection, points can be selected from any points on the modes illustrated in the dispersion diagram of Figure 12 with respect to desired wave structure across the thickness of the tubing, optimized for defect detection, classification, or sizing. To provide this flexibility, Figures 13A, 13B, and 13C show three different comb type ultrasonic radiators for producing uniform radial excitation over 360° where the spacing between the elements is related to the phase velocity value that is selected. Thus referring to Figure 12, almost any point may be freely selected for generation of an optimum guided wave. Thus in Figure 13A the spacing between the piezoelectric discs 61 and 62 is shown to be proportional to phase velocity. This disc is a solid piezoelectric disc which has a thin fluent couplant 63 within the tube 10. Figure 13B shows piezoelectric element 64 wrapped over a solid disc 66. Figure 13C illustrates piezoelectric elements 67 wrapped over a solid or cylindrical stepped rod 68. Frequency tuning may be accomplished by the tone burst generator of Figure 3. Figure 14 illustrates another conical wave structure similar to that of Figure 2 but with an annular array 69 encased in plexiglass 70 with a coupling to the tube 10 by a thin fluid couplant 71. Here flexibility is provided for an effective beam angle change and thus a phase velocity change by providing a time delay profile form one element to another. This changes the effective incident angle and thus the phase velocity. Six or seven elements 69 are sufficient for achieving a reasonable phase velocity and frequency choice. Change of time delay may be done by spacing as illustrated in Figure 7 or by electronic phasing means with respect to tone burst generator 29. Figure 15 illustrates spacing of the comb type filters between gap and element width. With the comb arrangement the gap is very large compared to the element width itself. In contrast with the conical annular ray of Figure 16, the gap should be as small as possible. Figure 17 illustrates a transducer receiver which has a conical element 73 encased in plexiglass 74 with a thin fluid couplant 75. Segments of the conical element 73 are longitudinal. Figure 18 is an alternative technique of achieving the comb type excitation of Figures 13A, B and C including beam splitting device 76 excited by lasers through an optic cable 77. The beam is split into a series of laser beams 78 which strike at various paths on the tube 10. Specific gap distances and time delay profiles are used to obtain the phase velocity and frequency values of choice. In summary an improved method of using guided ultrasonic waves for inspection of defects is provided. J after obtaining the complex eigen values k, the phase velocity Cph and attenuation a can be calculated in the following manner. from such curves determining attenuation versus f*d; and selecting points of substantially zero or minimal attenuation on said curves and determining the said frequency and phase velocity of such selected points and utilizing such determined frequency and phase velocity as said predetermined parameters for generating a guided wave having good longitudinal penetration in said tube. 2. A method as in Claim 1 wherein said predetermined parameters are implemented by utilizing a piezoelectric transducer having angled sides to determine the angle of incidence of ultrasonic waves on the side of a tube whereby by means of Snell's law said phase velocity is determined. 3. A method as in Claim 1 wherein said phase velocity is determined by a comb type system of piezoelectric ultrasonic radiators where the spacing, defined as width plus gap of the radiators is proportional to phase velocity. 4. A method as in Claim 1 where a tone burst function generator is utilized to generate said predetermined frequency parameter, said tone burst generator generating a burst of a predetermined number of cycles to control bandwidth. 5. A method as in Claim 1 where said phase velocity is determined by a conical annular array of ultrasonic radiators where the spacing of the radiators is proportional to phase velocity. generating a guided wave having said parameters by providing a said transducer with spaced ultrasonic radiators, said spacing being proportional to said specific phase velocity.